Over the past decade, the vehicles’possibilitieshave improved markedly. With the development of gyro technology, the developers can build their projects more effectively. 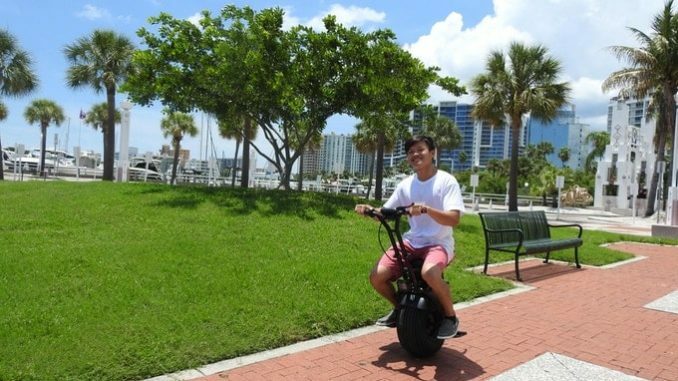 Uno Bolt is one of these examples, this is the world’s first electric unicycle scooter equipped with Gyro Force technology. Gyro Force technology used in Uno Bolt is similar to those used in segways and gyroscooters. According to Uno Bolt’s developer, Sean Chan, the Gyro Forcetechnology is a gyro giving birth to a gyro, meaning that it is more reliable, faster, and more comfortable. It is very easy to use Uno Bolt. When tilting forward the scooter accelerates, when pivoted back is stops and reverses. When tilting left or right it turns with Tire Assist system activating at the same time. It regulates the pressure in the tire to prevent the increase of slope. The scooter uses a motor with 1000W power, able to carry passengers weighing up to 127 kg and climb the slope to 45 degrees. When using lithium batteries Uno Bolt can reach a top speed up to 35 km per hour at a maximum distance of 40 km. Once the battery is discharged, a full recharge takes only 45 minutes, what makes this electric scooter incomparable to other analogs. For example,users can go for lunch and fully charge the battery before the end of the meal. The scooter is equipped withadditional optionsas like a rearview mirror, bright led headlight, a huge tire for traveling on the road or «off road», built-in display protected from bumps. The developers presentedthe third and the final version on Kickstarter. The second version was not presented to the public because it was purchased by James Cameron Production Company for use in the picture «Alita: Battle Angel», which will be released next year. Other developers also move forward and have effective models in their product line. These are a motorcycle Ryno or more modern MotoPogo. Even Ford tried themselves in this field.